In this installment we bring you our appearance at the Academy Theatre in October 2010 where we performed The Island of Dr. Moreau, featuring music by The Ghosts Project, along with Inhuman Rights, Rory Rammer, Space Marshal: Set Loose the Dogs of Time, and Bumpers Crossroads: The Stray Dog. This performance was a benefit for the Atlanta Humane Society and also included special musical guest Julie Gribble! Check out all the pictures on our Flickr album. Ok, first up, we know that using The Island of Dr. Moreau as a benefit for the Atlanta Humane Society sounds like a sick joke. …animals still face serious challenges every day due to neglect, maltreatment, habitat loss, and various other challenges. We wanted to help, and we felt that one of H. G. Wells’s more shocking stories might assist with that. And goodness knows we can use all the help we can get. This was also a musically packed performance. In addition to the usual brilliance of Alton Leonard, we were thrilled to be graced with The Ghosts Project! There they are, lurking in the background. 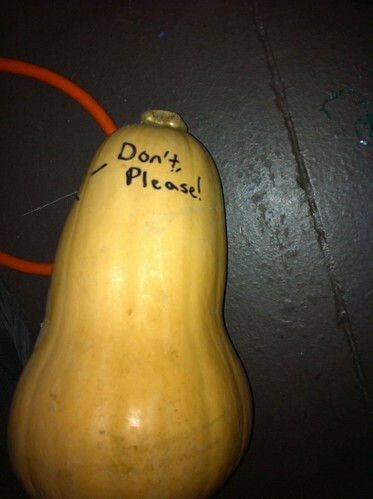 Try not to frighten them. Not to mention our very special musical guest, Julie Gribble! 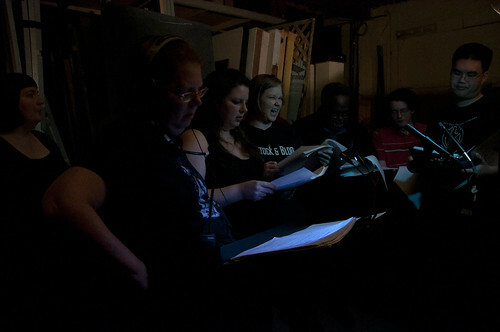 This performance also featured our Beast Men Chorus, led by Beastmistress Trudy Leonard. 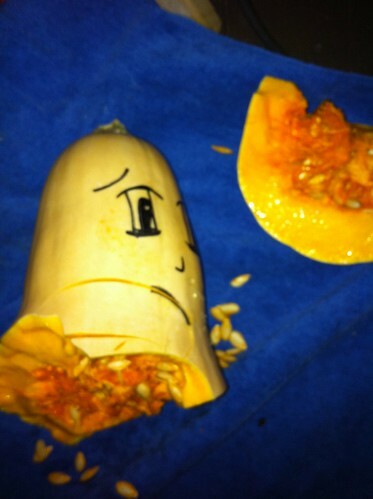 Not to mention one of the more violent Foley performances in ARTC’s history, involving a rubber mallet and a rather unfortunate butternut squash, used to simulate the cracking of the pantherwoman’s skull. Be sure to come see more crimes against produce as we mangle a grapefruit in our upcoming performances of The Passion of Frankenstein! There’s one more chapter left to go. And that’s the one where we go into the studio and make this sound as good as we possibly can. ARTC’s Podcast is a fine example of our work – as one of the few audio drama companies that we know of to perform live, we take pride in this work and want it to have a life beyond the one or two performances we are normally allowed to give it. It’s also a great example of what we do for people who may not be familiar with us. But it’s just a sample. In the studio we can get rid of feedback, get the exact right inflection, eliminate awkward pauses, make sure the effects are at the correct levels, and the music can really soar! 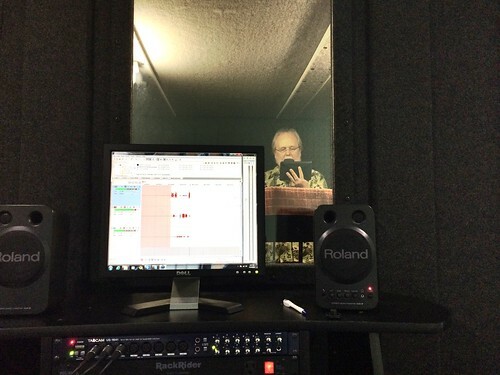 So if your only exposure to ARTC is our podcast, why not try out a studio production? You can get them here on this website or at Audible.com or Audiobooks.com. 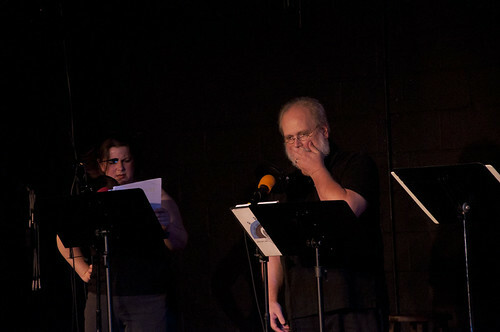 We thank you for listening, and we’ll be back next month with another example of the excitement of live audio theatre! We ended up performing The War of the Worlds: The Untold Story twice in 2013. 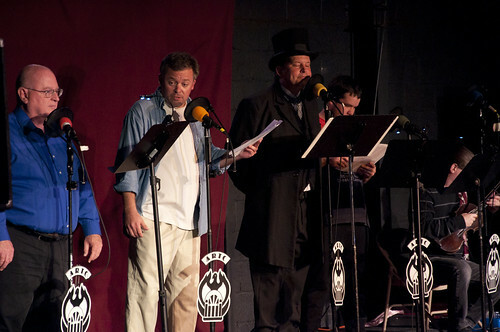 The debut performance was, of course, Dragon Con, which is where this podcast performance came from. But the second time was at the Marcus Jewish Community Center, and it was a blast. We cooked up a bit of new Foley since we weren’t going to have to work around convention crowds, and the MJCC sports a top-notch theatre space. We hope to get back there again some time! 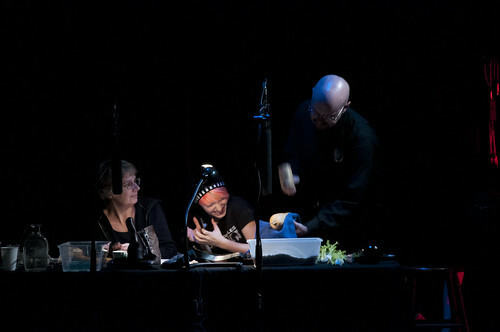 In this photo, you can see Foley mixer Larrie Fisher (left), and Foley artists Anthony Fuller, Beth Braunstein, and Jason Boldt (left to right), plus cast member Clair W. Kiernan (downstage). Society has somehow come to the conclusion that the actors are the ones in a performance to be celebrated, but the fact is that without Foley, audio drama isn’t quite as magical and we spend a ton of time developing ours to be as good as we possibly can. This month we bring you The War of the Worlds: The Untold Story by Ron N. Butler, based on the original novel by H. G. Wells, performed live at Dragon Con, September 1, 2013. 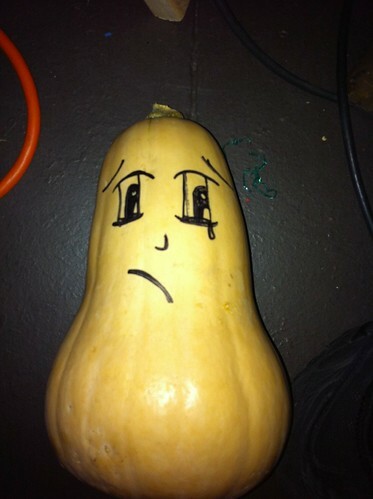 Making the decision to commission Ron to write this adaptation wasn’t easy. We’d sworn for years that despite our many adaptations, including a bunch by H. G. Wells, that we would never do this one. It seemed too risky to try to follow in the footsteps of St. Orson Welles. But in the end, the allure of commemorating the 75th anniversary of the most famous radio broadcast of all time proved too much for us, and so we went for it. We think the result was very much worth it. Be sure to let us know what YOU think! Tonight (2013-10-30) is the seventy-fifth anniversary of the night St. Orson scared the Ovaltine out of America using only his voice, the Columbia Broadcasting System, and a mayonnaise jar. Let me translate that for you: On the night of 30 October 1938, an adaptation of H.G. Wells’ ‘The War of the Worlds,’ presented on Orson Welles’s ‘Mercury Theatre’ radio program, resulted in widespread panic across America. Somebody might have even killed himself. Practitioners of the semi-lost art of radio theater in early-twenty first century America (I’m one) love that story. 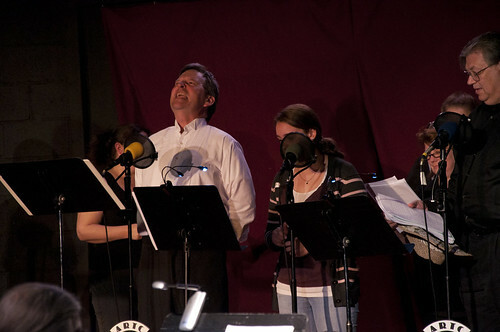 It is the ultimate high bar of achievement against which the effectiveness of any radio drama is measured. “Reach Out and Touch Someone,” indeed! And that’s the story WGBH’s “The American Experience” segment set out to tell. There was a little background on Orson Welles, on how Howard Koch came to write the adaptation, and on the production in the studio. (All the stuff I’d like to hear more about.) But the focus of the show was on how and why millions [sic] of Americans came to be hiding in their cellars breathing through wet towels, or (alternatively) legging it out for Canada. And “TAE” told it with interviews, archival photos / footage, and re-creations. How well, the story was told — That was a mixed bag. And it would have been a kindness to some of the interviewees to move the camera back. At least six feet. Into the next room for some. Or assign them a makeup artist. It was nice to see Orson Welles’s daughter, though she didn’t have much specific to add. In recent years, there has been considerable revisionism among sociologists (or at least pop-culture historians) that the public panic caused by the Welles broadcast has been exaggerated. It would have been interesting to have that issue addressed in this program. It wasn’t. Which makes this seventy-fifth anniversary program just another rehash. “When the legend becomes fact, print the legend.” That’s not just in the Old West. You can see it on WGBH, too. It’s hard to pin down which was the first time travel story (if you know, be sure to let us know or post about it in the forums!) but it’s undeniable the influence and effect that H. G. Wells’s The Time Machine has had on the general idea. Having the Time Traveller go so far into the future avoids the temptation to try to guess at what today’s modern trends and fashions would have evolved into in favor of exploring a completely alternate reality, while also taking a stab at the ultimate fate of mankind. This installment of the podcast, The Time Machine, will be presented in four parts. Written by H. G. Wells and adapted by Thomas E. Fuller, The Time Machine is one of the most well-known examples of classic science fiction. The original playbill for the performance. Illustration by Lindsay Archer! The Time Machine was performed live at the Academy Theatre on March 3 and 4, 2012, as a benefit for the Atlanta History Center. The following was contributed by ARTC writer Ron N. Butler regarding his experience writing “The War of the Worlds: The Untold Story”. Beware: Here be spoilers. Hear The War of the Worlds: The Untold Story for yourself LIVE on October 20 at the Marcus Jewish Community Center at 2:30pm and 7:30pm. Somewhere in my library (I intend to alphabetize my books after I retire) I have a slim, fragile paperback titled Sherlock Holmes’s War of the Worlds, by Wade Wellman and Manley W. Wellman. It is a briefer story even than the slenderness of the book indicates; halfway through, it becomes Professor Geo. E. Challenger vs. Mars, following the adventures of another of Conan Doyle’s creations through the Great Martian Invasion. I’ve read it much more than once and enjoyed it every time. Still — When you get down to it, neither Sherlock Holmes nor Professor Challenger actually does much to thwart the Martian invaders, to prevent humanity being pushed down a notch on the food chain. That’s inherent, I think, in the approach the Wellmans took to the material, but still somewhat unsatisfying. The Wellmans’ stories take their cue, too , from Wells’ original story. Wells was making a point (something to do with the barbarous way “civilized” imperialists treated the “lesser breeds” in those days, I think), but to do it he made his countrymen rather, well — pushovers. The British military forces are routed by one or two encounters with the Heat-Ray and the Black Smoke, and civilization disintegrates inside a week with the entire population fleeing pell-mall for Scotland or France. Between that young writer and us however lies the Twentieth Century, the history of which makes us skeptical of the simplicity of Wells’ narrative. Less than twenty years after the serialization of The War of the Worlds, the armies of the First World War faced the Earthly version of “Black Smoke.” Contrary to the promises of its inventors, it did not sweep all before it and end the stalemate on the Western Front (though it did add to the slaughter). The Second World War showed that almost nothing could drive a city’s inhabitants out of their digs, even if their “digs” were literally “dug” — basements and cellars under piles of rubble. The web of civil society proved surprisingly tough, first in London and Coventry, eventually in Berlin and Tokyo. Similarly, the Century of Technological Warfare abounds with Wonder-Weapons that did not live up to their billing: Poison gas (see above). Bombing airplanes that did not “always get through,” and had a persistently hard time delivering explosive ordinance within miles of a target when they did. “Land ironclads” that succumbed to a spiraling competition between the thickness (and weight) of their armor vs. the shaped-charge anti-tank weapon. The seemingly simple process of moving troops from ships to shore took years and many millions of dollars to reduce to a routine. These were the two notions in the back of my mind a couple of years ago when I considered writing a radio script along the lines of the Wellmans’ pastiche. What with other projects, though, it just never happened. After DragonCon 2012, however, Bill Ritch asked me if I would consider writing a War of the Worlds script for our 2013 show. For one thing, 2013 would be the seventy-fifth anniversary of the Orson Welles Mercury Theatre panic broadcast. We also had a possibility that one or more DragonCon guest-actors would like to perform with us. “Whatever you want,” he answered. First, Earth is not Mars, even Wells-ian Mars. England in June looks idyllic to us, but it would be an alien environment to a Martian. All that water, for one thing. Wells has his Martian fighting-machines wading confidently across rivers and into the sea. But what do Martians know of muddy, boggy river bottoms vs. stony channels as footing for huge machine feet? And what does saltwater do to the joints of a walking machine designed by engineers used to near-zero humidity and water confined to canals? And I assure you that saltwater and aluminum (or “aluminium,” the principal structural material of the tripods, per Wells) do not play well together. Second, I wanted to write about someone who fought back. By preference, someone from A. Conan Doyle’s universe. It would have to be a man (or woman) of action. Highly intelligent. Broadly educated. Possessed of accomplices, a support network and resources that would not run away at the approach of the Martians. And, because the situation is truly desperate and the stakes are literally global, ruthless. I think one name presents itself above all others. I didn’t say he had to be a nice guy. The Time Machine has been adapted for audio at least 5 times, including our own rendition, by various companies around the world since 1948. There have also been no fewer than 4 movies or teleplays and it has inspired countless other media, including books, television shows, movies, comics, animation, and much more! If you like ours, be sure to let us know or post about it in the forums! 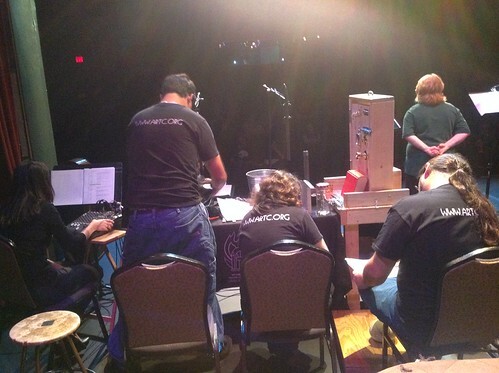 Final dress rehearsal for The War of the Worlds: The Untold Story! The Time Machine was part of ARTC’s cassette catalog for a long time. When we started the process of converting our offerings to CD, however, we decided that this piece needed a new treatment in the studio. Thomas Fuller had done a rewrite of the script after the original cassette had been released and had considered the new script to be the superior version. So, at the moment, The Time Machine is considered out of print, but we have big plans to bring it back into the studio! Also on that out of print version was Brad Strickland’s A Glitch In Time. We’ll be bringing that back, too, possibly sooner rather than later.